Genesys Health System, a member of Ascension Health, is a group of affiliated medical campuses, outpatient centers, primary care locations and ancillary health care organizations with a mission and history of improving our community’s health for over 80 years. As the leading health care provider in mid-Michigan, Genesys is anchored by a 21st century inpatient facility – Genesys Regional Medical Center at Health Park – one of the first medical centers of its kind built both clinically and architecturally around a patient-focused care philosophy.Genesys is accredited by JCAHO, HFAP (Healthcare Facilities Accreditation Program) and the state of Michigan Department of Consumer & Industry Services (MDCIS).Genesys has been an America’s 50 Best Hospital for the last 4 years in a row. With operating revenues of over 410 million, Genesys is a regionally integrated health care delivery system comprised of a complete continuum of care primarily servicing Genesee, Shiawassee, Lapeer, Oakland, Livingston and Tuscola counties with an additional four counties in the secondary market. Over 140 family physicians in the Genesys network act as health advocates offering ready resource to outpatient ambulatory care, physical medicine treatment, and mental health services. Recuperative or extended care is available at Genesys Convalescent Center, and Genesys Hospice provides a much-needed care base for those with a life-limiting diagnosis. In addition, Genesys offers numerous in-home services including home health care, medical equipment and supplies, respite care and other related home care personnel and services. For those immediate urgent or emergent needs, Genesys provides after hours clinics in three locations (evenings, weekends, and holidays) and full service, emergency care in three locations ready to handle any major illness or injury. With a legacy of clinical excellence and a longstanding tradition of compassionate, patient-focused care, McLaren Regional Medical Center (MRMC) continues to be mid-Michigan’s leading health care provider. McLaren Regional Medical Center is a 404-bed teaching hospital. Based in Flint, Michigan, and affiliated with Michigan State University College of Human Medicine, MRMC blends the experience and expertise of its medical staff with MSU’s physicians-in-training, thereby delivering academic, clinical and research-based innovations, world-class treatment, and cutting-edge technology to mid-Michigan residents. Behind the scenes, physicians, surgeons, and other health care professionals develop and master cutting-edge treatment and technology-all aimed at improving the quality of life for young and old alike. At every step of their health care journey, patients are provided with the highest standard of care. McLaren is proud of its 2,600 employees and 600 medical staff members for their commitment to providing quality patient care and continued pursuit of excellence. It is this unique blend of “high tech” with “high touch” continues distinguish MRMC from peers, and it is McLaren’s commitment to clinical quality that earned McLaren its place among the Top 100 Hospitals nationwide. St. Joseph Mercy Oakland (SJMO) is a 443-bed comprehensive, community and teaching hospital and a long-time leader in health care in Oakland County. The hospital is located on the west side of Woodward, just north of Square Lake Road in Pontiac, Michigan. It is a member of the Saint Joseph Mercy Health System, a subsidiary of Trinity Health, the country’s fourth largest Catholic health care system. A member of the Pontiac community for more than 80 years, SJMO’s $54.5 million renovation and expansion of its west wing demonstrate its commitment to meeting the needs of the community. Our new, two-story, 50,000-square-foot Surgical Pavilion enables us to combine advanced technology with compassionate care to create a unique healing environment. A different experience The St. Joseph Mercy Oakland (SJMO) experience is different from that of other hospitals and is what makes SJMO a leading health care institution. 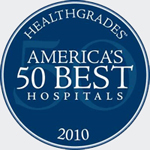 Is ranked in the top five percent of hospitals across the nation for clinical excellence. Has earned itself a position among the top 100 cardiovascular programs in the United States. Is Michigan’s first certified primary stroke center and one of 19 in the state today with this designation. Has received national recognition for palliative care programs. Is a nationally recognized leader in joint care and a model for orthopedic programs across the country. Offers a continuum of care for Cancer treatment, with access to ongoing clinical trials and new treatment options. Is Northern Oakland County’s hospital of choice and has received national recognition for being in the forefront of patient safety and quality. It has transformed the way care is delivered by uniting state-of-the-art computer information systems to create a 21st century health care organization providing world-class patient care and safety. The heart of the hospital is comprised of a team of understanding nurses, physicians, administrative staff, volunteers and families. These people are here for one reason: the patients. Day in and day out, this dedicated team consistently provides compassionate care and services that make a difference in the health and well-being of the communities and patients they serve by making personal connections. For example, SJMO has launched an Hispanic clinic for women’s health, created a health care clinic for the working poor, reached out to congregations through Faith Community Nursing, added soothing elements to the emergency center, placed a spare bed in a private room for a spouse to stay close by and allowed an ailing patient to order his favorite milkshake from his hospital bed. With our leading technological advancements and personalized care, we are efficiently providing the best quality of care to our patients. As a faith-based organization, our mission is to improve the health of our entire community, and we continue to partner with our stakeholders to tackle challenges facing all of its people. We offer compassion and kindness to every patient, family member and guest who walks through our doors and to those who live and work in the community we serve. By personalizing service, connecting with the community’s needs and offering a health care experience that seeks to heal the patient’s mind, body and spirit, we retain our position as a leading health care organization and a vital community resource.